I had been looking forward to this day the entire trip. 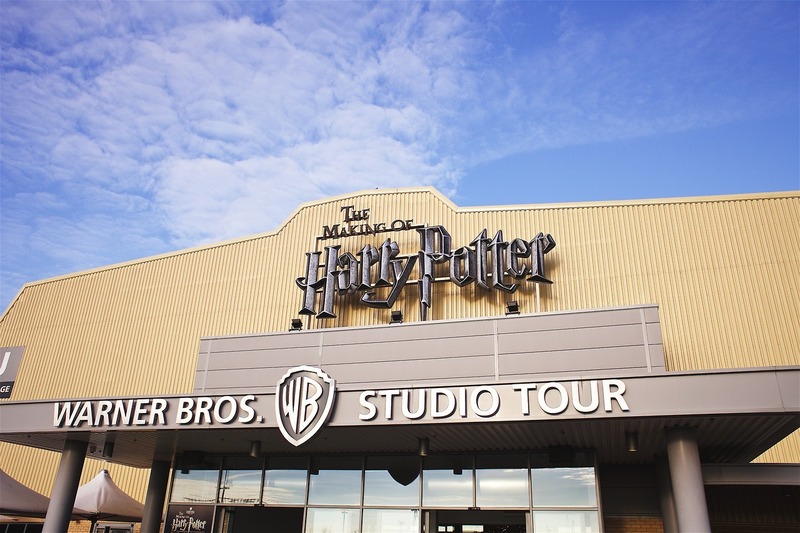 This morning, we left to travel to the Harry Potter Studio Tour in Leavesden, which is 20 miles outside of London. 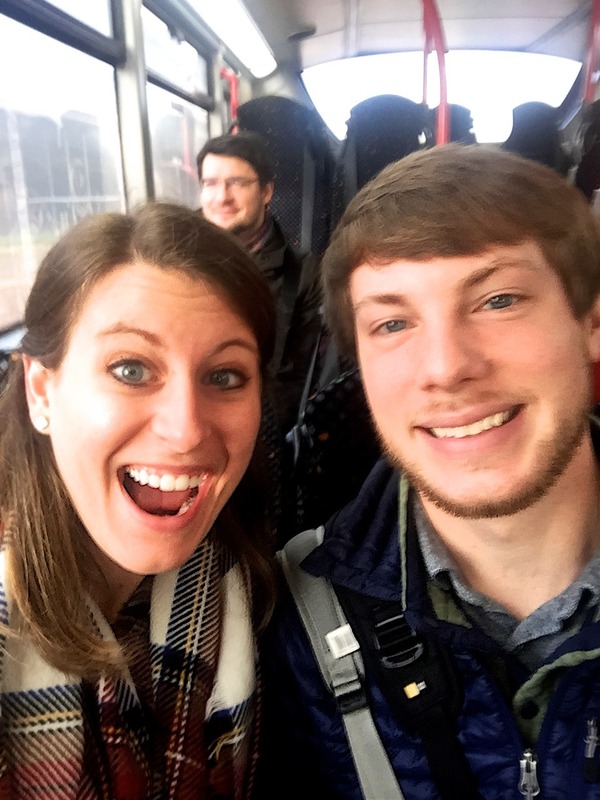 We took the tube to Euston Station and then had to buy separate tickets to Watford. We also learned there are actually two trains that go to Watford Junction, one is direct and one has multiple stops in between. We were on the wrong one at first, and would have missed our tour, but a fellow passenger asked someone near us, and we realized we were about to leave on the wrong train. We immediately got off and asked where the right one was and ran to it because it was leaving in less than 5 minutes. We made it on with a couple minutes to spare and considered ourselves very lucky. At Watford Junction, they have a bus stop specifically for the studio tour, so we got on the next bus and got to watch a welcome video on the way. This is the point that we were getting really excited! 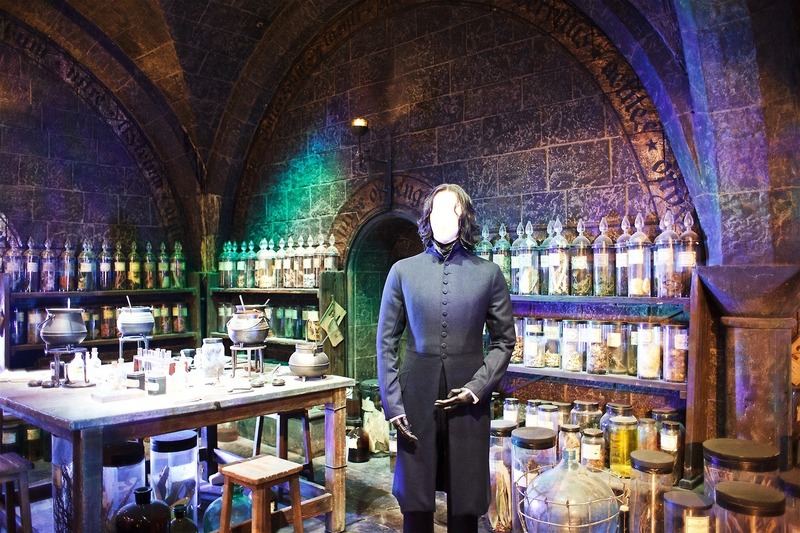 After a ten minute drive, we arrived at the studio tour. We picked up our tickets and got in line. The movies were filmed on the soundstages in this studio which you don’t get to go to, but many of the most famous sets were moved here to be on display. 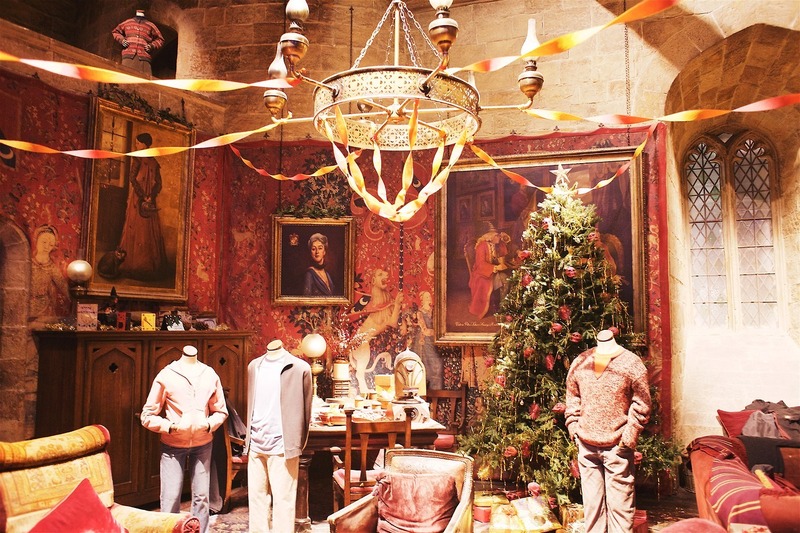 Since we were there in January, the studio had a special event called “Hogwarts in the Snow” where they had some of the Christmas and winter themed props included. The first thing we saw when we walked in was the huge Christmas tree from one of the movies. 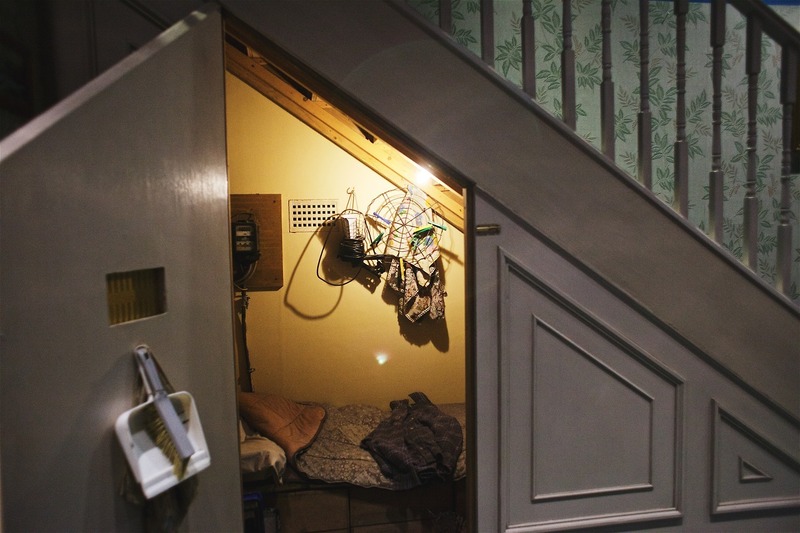 Next to the line to go in was Harry’s cupboard under the stairs set. Once we got in, we sat in a theater where they played a short film with some of the actors. 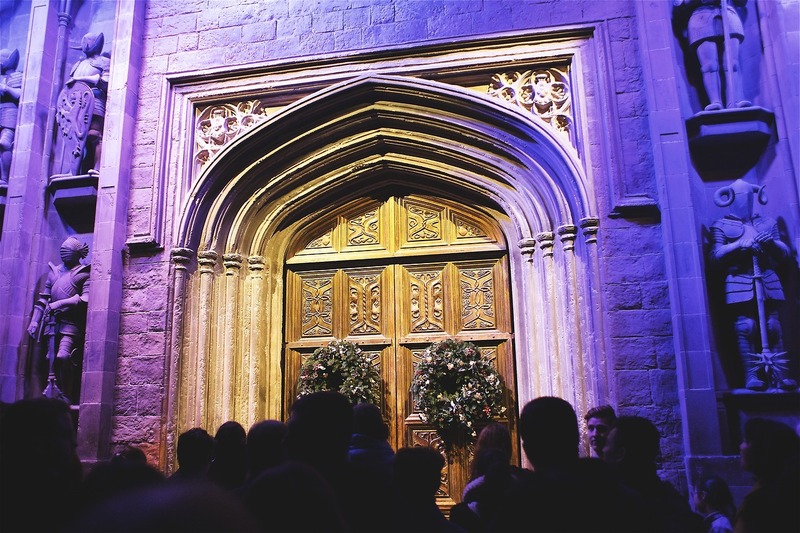 The film ended with a shot of the great hall doors. 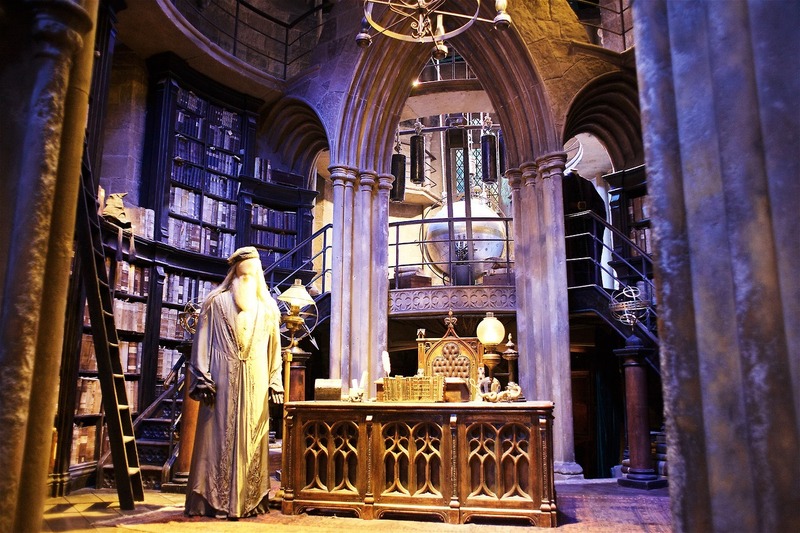 All of the sudden, the screen lifts up, and there stand the real great hall doors! I was about to die of excitement at this point. 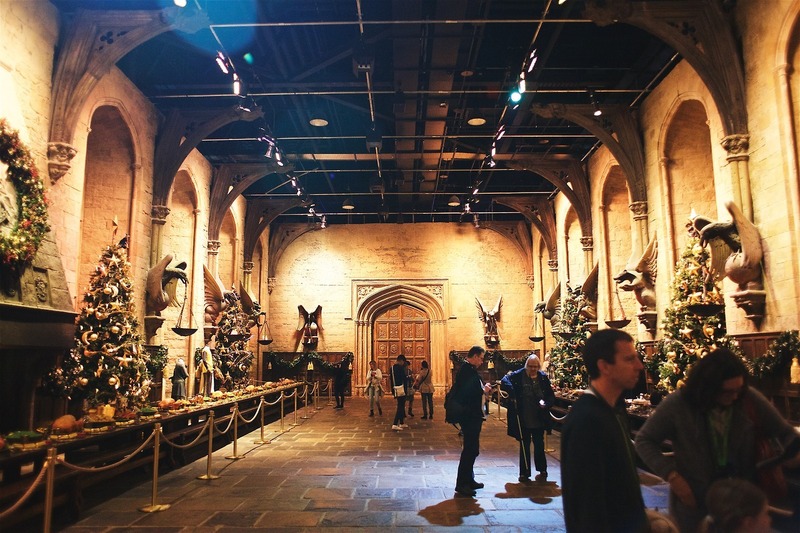 They opened the doors, and we entered the great hall set. From here, it was a self guided tour and we saw sets including Dumbledore’s office, the Gryffindor common room, potions classroom, Hagrid’s hut, the burrow, and many more. Wardrobes were on display for many of the characters, and one of the more interesting things we found was the progression of some of the identical outfits as they got dirtier and more ripped during battle scenes. 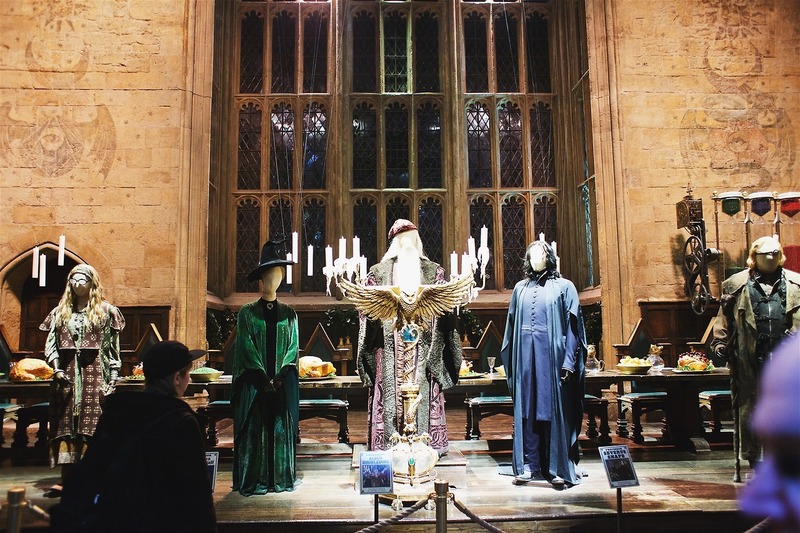 Iconic items were on display such as all of the horcruxes, the triwizard cup, the main characters’ wands, the golden snitch, the time turner, and Harry’s invisibility cloak. We even got to ride a broom against a greenscreen! We wandered through this section for a while taking in every detail. The next part led out to the Hogwart’s Express train! We got to climb on it and look at different train cars that they used to film a lot of scenes in. I also got a picture with the luggage cart at Platform 9 ¾. We had made it halfway through at this point, and we took a break to get a snack. We split a sandwich and chips and we couldn’t resist a butterbeer! We’ve been to Universal Studios in Orlando, so we had tried the butterbeer before, and it was just as good in London. We had never tried the butterbeer ice cream, so we got a cone and walked outside to the next part of the studio. Here, they had the Knight Bus, Privet Drive, Arthur’s flying car, Harry’s house in Godric’s Hollow, and the bridge to Hogwarts which Cole got to walk across. We came in from outside into a new part of the studio, the animatronics and prosthetics section. We saw Buckbeak and the werewolf and learned out they combined real people and animatronics for different shots, mainly Hagrid. We then got to walk down the real Diagon Alley set and look at all the stores. The finale of the tour was the 1:24 model of the Hogwarts castle which was used in all 7 movies and it really was breathtaking. It was super intricate with windows, lights, and it was even set up to where it looked like people were walking past the windows. The set was on a cycle that switched from daylight to night so you could see both perspectives. We walked out through Olivander’s wand shop through thousands of handmade wand boxes, each labeled with the name of someone who had worked on the movies. We aren’t necessarily super fans of Harry Potter, but the tour really was amazing. We learned so much about the processes and efforts that go into making a movie that are unnoticed by the audience because they are supposed to be! One video talked about how if you notice the background or atmosphere, they did not do their job correctly because the point is to be immersed in the scene. It really made me appreciate the filmmaking business more, and we highly recommend the tour to anyone. We made our way 20 miles back to central London and went to Pieminister at Gabriel’s Warf to get a meat pie as a snack. We got a steak and ale pie and a veal and lentil pie, both with gravy and they were really good. We walked along the Thames for a while and across the bridge during sunset. We had reservations at the Strand Palace Hotel for afternoon tea next. I changed clothes into something a little fancier and we relaxed for a while before our reservation. Afternoon tea was absolutely delightful! We got our own spot in the corner and settled in for a couple hours while we tried different types of teas and snacked on finger sandwiches, scones with clotted cream and jam, and a variety of sweet treats. The last event of the night was going to see The Phantom of the Opera at Her Majesty’s Theatre!! Phantom is my absolute favorite show and I was so excited to have the opportunity to see it in a different country. It was amazing of course, with maybe the best Phantom I had ever seen live. Overall, this was a hard day to beat. Between the Harry Potter studio tour, afternoon tea, and Phantom, it was a pretty exciting and amazing day.